The Hayward PowerFlo 1.5HP with 20" Pro Series Sand Filter System is the perfect Pump/Filter combination for Above Ground Pools and Spas. 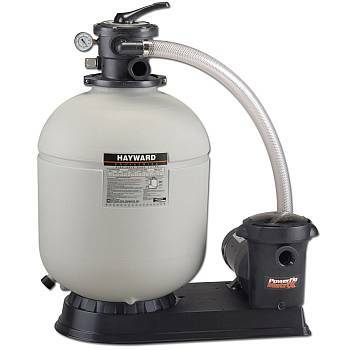 The Top Mount Sand Filter, 20 Polymeric Tank, 6 position Filter Control Valve, 1.5 HP Power-Flow LX Pump, One Piece Deluxe Base pre-drilled to accept timer and automatic chlorine feeders (not included), 1.5" Hose Package (Two 6' x 1.5" lengths of hose, hose adapters and stainless steel hose clamps) This item is too big to ship UPS and must be shipped by common carrier truck lines. Shipping generally runs around $60.00 to $90.00 depending on what part of the country you live in. Click here for a Swim Clear Owners Manual.